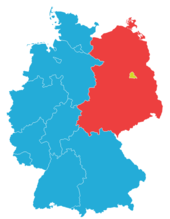 Map shawin the diveesion o East (reid) an Wast Germany (blue) till 3 October 1990, wi Wast Berlin in yellae. The German reunification (German: deutsche Wiedervereinigung) wis the process in 1990 in that the German Democratic Republic (GDR, colloquially East Germany; German: Deutsche Demokratische Republik/DDR) becam pairt o the Federal Republic o Germany (FRG, colloquially Wast Germany; German: Bundesrepublik Deutschland/BRD) tae form the reunitit naition o Germany, an whan Berlin reunitit intae a single ceety, as providit bi its then Grundgesetz (constitution) Airticle 23. The end o the unification process is offeecially referred tae as German unity (German: Deutsche Einheit), celebratit on 3 October (German Unity Day) (German: Tag der deutschen Einheit). This page wis last eeditit on 3 Dizember 2018, at 00:14.